What is Canon complaining about and how does an ITC investigation work? Detractors label generic cartridges as patent infringing "clones" but there's much more to the story than that. The original equipment manufacturers provide us with cheap printers but the total cost of ownership is a different story once four-years of replacement cartridges are accounted for. The International Trade Commission is perfectly qualified to adjudicate the complaint but, who will prevail and can the litigation-cycle be broken? Canon prevailed in 2012 and 2014 obtaining General Exclusion Orders preventing certain designs from importation to the U.S. However, the respondents redesigned their products, just as they are now doing in the '1106 matter. 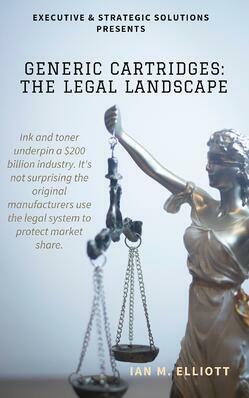 The litigation targets manufacturers, distributors, and resellers of new-build cartridges. However, while the OEM filed the complaint, media outlets sponsored by the remanufacturers were quick to jump on the bandwagon. New build generic toner cartridges cost less to make than remanufactured cartridges and have no supply chain constraints. This means they represent a threat to the remanufacturing business model. The investigation will be completed within eighteen-months of commencement but will the outcome be any different to the previous ones? Inside six-months of the complaint being filed the respondents already have redesigns in the marketplace, irrespective of the final determination of the ITC investigation. Is there a place for generic ink & toner cartridges in a resellers business? But, does it do enough to avoid OEM patents?